Taking a new tack. Our guest author is the famed water dog, Stella Ann. She does have her own facebook page, but has agreed to contribute some thoughts to CwHD. Stella suggested changing the name of the piece to Conversations with a Salty Dog, but Zudnik objected. 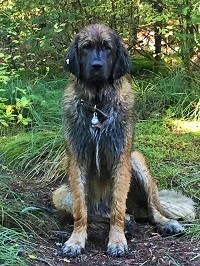 Stella is a leonberger. The breed name derives from the city of Leonberg, Germany, where the animals were first bred. A mix of Great Pyrenees, St Bernard, and New Newfoundland, males can weigh as much as 170 pounds, while females usually weigh in around 130 pounds. They became internationally known as guard dogs as well as search and rescue dogs, particularly on water. Some people think leonbergers are haughty creatures. Not so. Consider the word 'aloof'. Back in the days when Shakespeare penned his plays, a common Dutch word loef meant 'towards the wind' or 'into the wind'. Windward. English sailors adopted the phrase; and, with usage, it became aluffe, aluff, and aloof. Sailors were using the term to describe a ship sailing into the wind, usually one trying to beat off a lee shore. Bad business, those lee shores. Usually rocky and unforgiving. Old sailing ships did not do well going to windward. 15 degrees off the wind was about as good as they could manage. If the wind were strong enough and the seas high enough, the ship was doomed. Sailing with her head pointing high into the wind became the goal of every ship as it made its way off the rocky coast. The term was also used for a ship that could point higher than others in a fleet, and so drew apart. 'Aloof' these days is a word whose salty antecedents are largely forgotten. It has come to mean one who stands apart with a connotation of arrogance, condescension, pomposity. 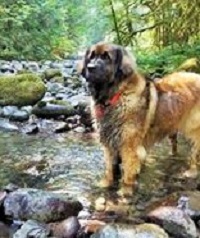 An arrogant leonberger? I don't think so. We might knock you down in play and slobber your face with kisses, but aloof. Not a bit of it.